Have you ever heard about bobbin laces? First they appeared in Italy and Belgium, next they spread into France, Germany, Spain, England, Slavic countries and all over Europe. In Poland bobbin laces have also very long tradition. This technique came to Poland in 16th century from Italy thanks to Bona Sforza (the second wife of Sigismund I the Old the king of Poland) who brought to us new vegetables, artists and also ... laces teachers. Little by little each region created his own style. Today the most known place in Poland where these laces are still alive is Bobowa in Galicia. 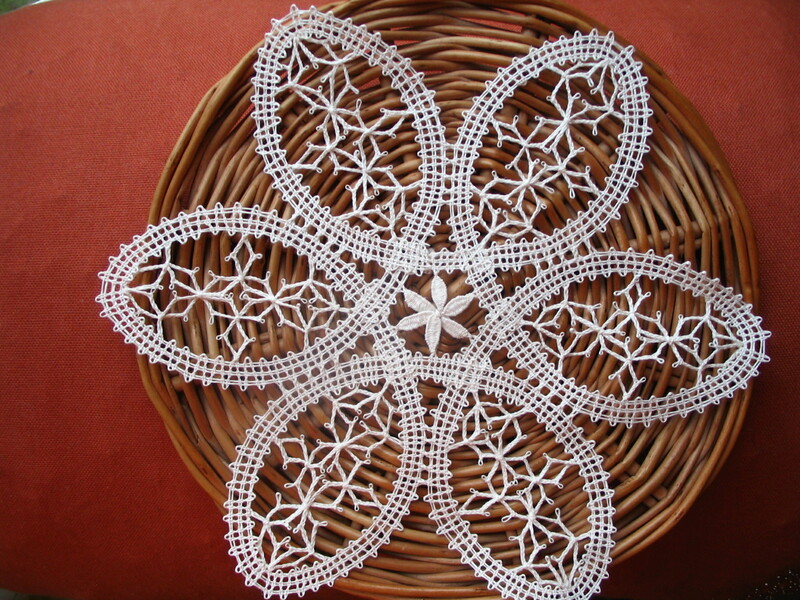 I had some lessons there so I would like share with you this composition as an example of Polish lace. i am half danish and one summer when i went back after high school in the states...my mother introduced me to her childhood friend who had become quite known for her work...large scale bobbin lace tapestries,too. though the technique to the untrained eye seems impossible...i recall how relaxing the simple turns and twists could be in revealing the finally piece of work. i still have my bolster and bobbins...and all the pieces i have made over the years. those lessons many years ago taught me great patience and especially, appreciation of other old world crafts. thank you for sharing this one with the group. I agree, doing this it is a great pleasure. I am excited every time when I do a new lace. It is calming and relaxing and great to keep brain longer young because of precise fingers moves. It would be wonderful if you had any photo of the pieces you wrote about. Have you them? Is it possible to show them to all of us? By the way I attach a short video how bobbin laces are created. i say if a curious eighteen year old (when i first learned) can do it...and i have seen those into their eighties do it - anyone can learn if their curiosity is there. what do you think, magdalena? i need to take my bolster out of storage (thanks for the inspiration) and then find my pieces to post along with any patterns i might have...and resume making lace again. here is a copy of how my red bobbin lace bolster (half bolster) looks like...but, this example is in green. the bobbins are the same type as i use. It sounds really great that you intend to refresh your skills. I will wait impatiently for the effects of your work. I think that this forum is a good place to share photos. There is a little complication with patterns. If I share my own pattern which I created myself or if it is well known traditional pattern or the author of it agrees to show it publicly - then it is ok.
On the other hand I know that many creators sell their patterns and for them it is one of the way of earning money. So sharing patterns will be great but with respect for intellectual property. I wanted to learn how to make bobbin laces ever since I watched a TV program about it. There were hundreds of bobbins and thousands of pins and it was .... amazing. I just had to try to learn a little bit, and although it is not very easy, it is possible to learn it and have a great pleasure whilst working. Not so many people know what the bobbin lace is, so I prepared a short video to present you one little doily which I like very much. If you are lover of handicraft or just like to read uncommon stories we have prepared for you a short article concerning bobbin laces on our blog. There are some new photos and some stories that you may find interesting. 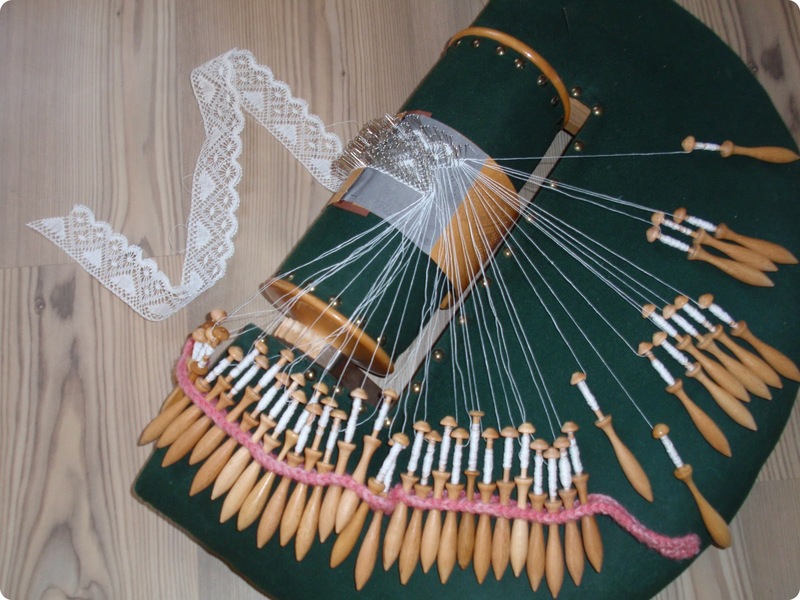 At the end of October I had a chance to be on Bobbin Lace Festivat in Bobowa (Poland). I made enormous number of photos. I like returning to them and watching for hours. Thank you for sharing the incredible photos from the festival. You showed us the beautiful Lace patterns and styles that we most likely would not know existed! I am happy you liked it This is my great hobby.